Tortula truncata at OSU-Mation Campus Prairie, Marion County Ohio. November 5, 2007. Tortula truncata at Batelle Darby Metro Park. Franklin County, Ohio. January 7, 2012. Notice the capsules without a peristome. How to recognize Tortula truncata: Little blunt-fruited beardless moss is a very small cushion moss with 1.5-2.5 mm broad, serrate leaves with a single midrib leading to a stout apiculus or awn. The sporophytes are up to 8 mm long-stalked and bear capsules that are upside-down rounded cones. The initial sporophyte cover, the, calyptra is cucullate (split along one side, thus fashioned like a hood); this cover falls off after the sporophyte is completely grown. The species somewhat resembles urn moss, Physcomitrium pyriforme (Funariaceae) which occurs in similar habitats. They can sometimes by distinguished by their seasonality, with T. truncata typically producing sporophytes in fall, although it sometimes matures capsules in the spring, when P. pyriforme regularly does. Also, Physcomitrium pyriforme capsules are upside-down pear-shaped, and are capped by a mitrate (non-split), rather than a cucullate, calyptra. 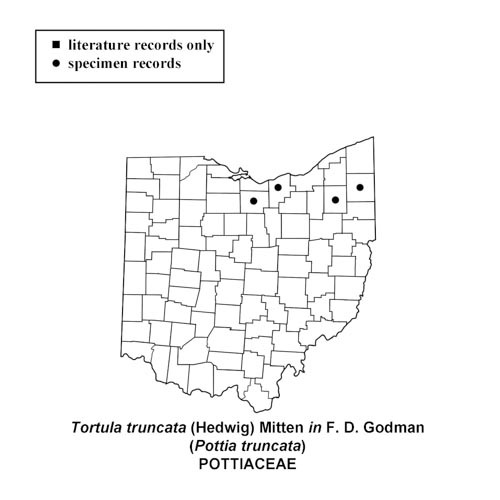 This moss was formerly known as Pottia truncata, until 1993 when Richard Zander’s “Genera of the Pottiaceae” was published. Other members of Tortula have 32 long sprirally twisted peristome teeth, while T. truncata has no peristome. 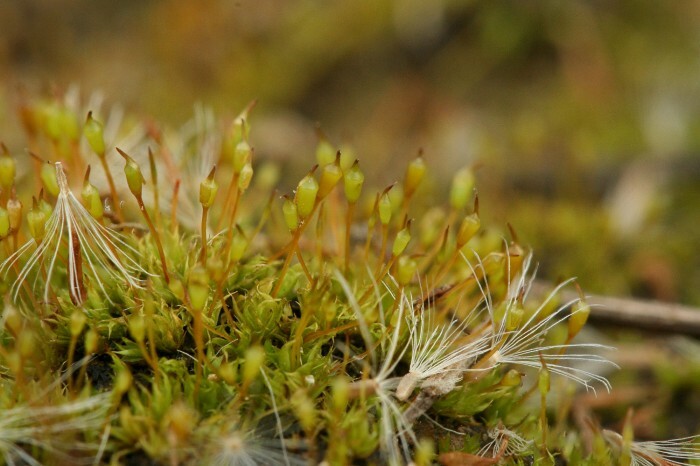 Where to find Tortula truncata: Look for this moss on bare spots in next to and in fields or along paths and other bare spots in grassy areas. 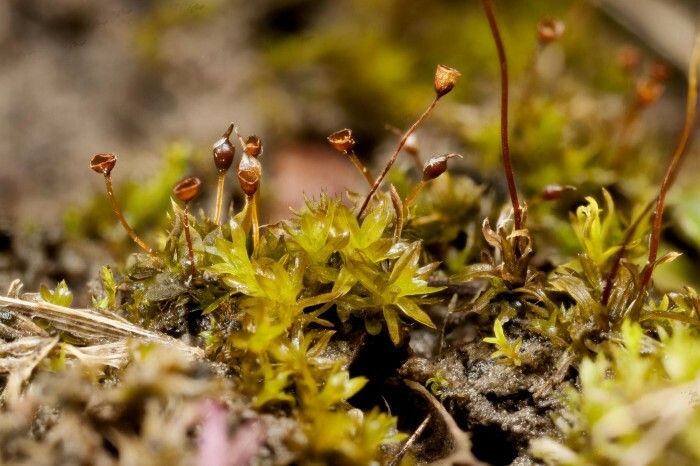 One of the difficulties in finding it is that it is usually noticeable only when the sporophytes with their 0.4-0.8 mm long capsules are present. There are strikingly few confirmed records for this arable moss; it is no doubt much more widely distributed than the records indicate.